In order for waste management to be as efficient and time-saving as possible at your warehouse, it is not sufficient to just focus on what machines you need but also to pay attention to the internal logistics. The entire waste stream has to be optimized: waste being transported from the source, where goods is unpacked, to a baler or briquette press in the warehouse and then bales and briquettes being transported to a collection point outdoors for pick up and transfer to a recycling station. 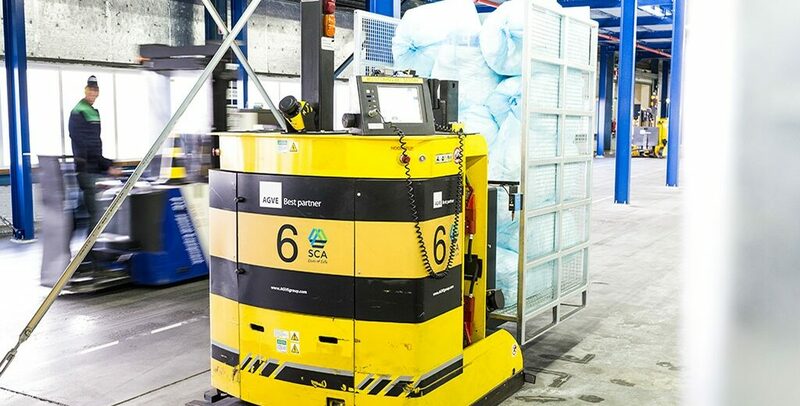 This article presents how a large warehouse invested in AGV (Automated Guided Vehicles) forklift trucks and improved internal logistics. A large Swedish e-commerce warehouse, that handles a lot of products sold online, faced a big challenge. 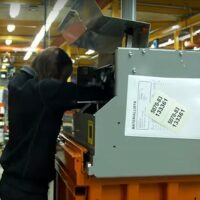 When a large amount of incoming goods was unpacked and then repacked, it generated a lot of packaging waste that had to be dealt with in a smart way. The used packaging material was thrown into bins and due to the vast accumulation of waste at the different picking stations, the bins had to be emptied up to 50 times per day! The waste handling resulted in a significant loss of valuable working time in the warehouse. The warehouse realized that they needed help to optimize their waste management, especially in terms of logistics in the warehouse. To meet the challenge and efficiently manage the daily vast volumes of waste, Orwak’s Swedish sales organization – ATS-Orwak – proposed a modern high-tech solution that involves AGV forklift trucks. It is solution that works very well for another customer in the Netherlands. All picking stations have their own bins that get filled with empty packaging material. When a bin is full, a signal is automatically sent to one of the AGVs that operates in the warehouse. 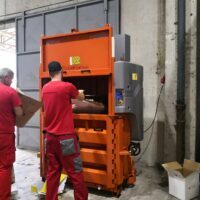 The AGV picks up the bin and transports it to the waste station, where, with the use of a bin lifter, the packaging material is disposed of into a compactor. The empty bin is then returned to the pick-up station. Depending on the volumes of waste and on the preferred recyclable waste product – bales or briquettes – the packaging material can just as easily be emptied into a horizontal baler or a briquette press. 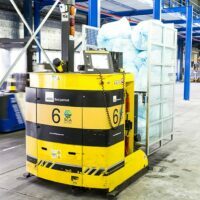 This type of solution based on AGV forklift trucks is unique in Sweden, but it is very likely that more companies will embrace this type of smart and effective solution. An AGV forklift truck of this type can make 80 rounds per day, which is time-saving and increases productivity in the business significantly. If you are planning to rebuild, expand or move a warehouse or distribution center, or want help to optimize the internal waste logistics on your premises, please contact Orwak! We are happy to guide you to the optimal waste management solution for your business.